Photo Caption: Here is São Paulo- Picture of the sprawling Brazilian city, taken from the balcony of my 15th floor apartment in Santana Gold hotel. TUESDAY, 10 June was a rather stressful day for me here in São Paulo. Having retired to bed very late on arrival on Monday night (2am Tuesday actually), the first task my colleagues and I embarked upon was to secure another hotel. The IPE Hotel on Avenue Emilio de Ribas which we had booked from Lagos turned out to be less than satisfactory. Not only was it choked up and a little way out of central São Paulo, it's room rates were way ahead of the services and conveniences it had to offer. 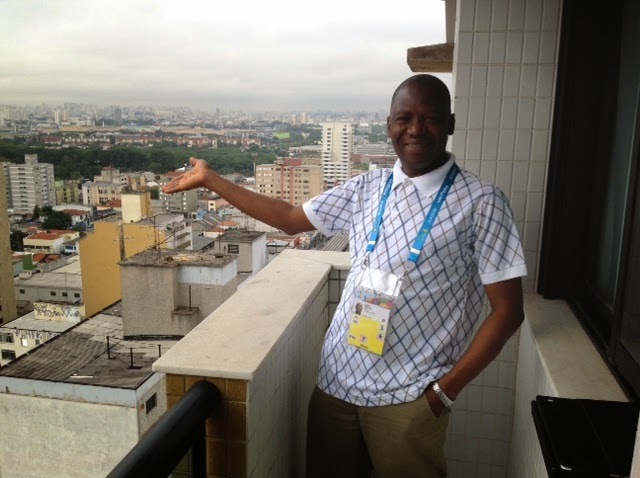 With the help of Michael Adjuya, a Nigerian who works in São Paulo as an English language teacher and who has volunteered to serve as our guide here, we were able to secure a new accommodation at Brasilia Santana Gold Hotel on Rua Dr. Olavo Egidio, a busy street in central São Paulo. Now, for anyone still in Nigeria, heading for São Paulo without an hotel booking yet, you may wish to consider Santana Gold. Santana is a name that actually brings to memory the former Brazilian coach to the 1982 World Cup in Spain, Tele Santana. That team featuring some would-be legendary names such as Socrates, Zico, Falcao, Eder and the rest is rated by soccer purists as the greatest team NOT to have won the World Cup following their shock 3-2 defeat to Italy, courtesy of a hat-trick by a certain Paolo Rossi who became a World Cup legend instead. Santana made a second futile attempt with Brazil at Mexico '86, but that second team never reached the dizzying heights of the '82 set in terms of performance, much less achievement. So, with Santana hotel secured (I'm actually writing this from my hotel room on the 15th floor!) my next task was to get my media accreditation badge. Micheal the Nigerian had secured a bus to take us around for the day and off we went to the magnificent, brand new Arena de São Paulo Stadium in Itaquera, São Paulo. Approaching the stadium partly explains why average Brazilians have been protesting against their government for spending huge funds on organizing the World Cup at the expense of the people's welfare. The stadium sits majestically atop a hill surrounded by middle and lower class dwellings in the Itaquera neighborhood. The road infrastructure around it - particularly the bridges- is as new as the stadium and will be a lasting legacy for Itaquera for hosting the World Cup. Scant consolations for poor Brazilians without housing, education and health care, I would think. Na road we go chop?! But I'm not here just to look at brand new bridges, so off I went to the World Cup accreditation centre, a short walking distance downhill from the stadium's main bowl. We ran into veteran Nigerian press photographers James Agori and John Ebhota who had just collected their own badges and they showed me and my colleagues the way. Accreditation went like clock work. First stop was verification, next stop was photo snapping, the final stop was badge collection. Plus all the time spent on those three queues of local and international journalists and other officials from around the world who were there for the same purpose, my accreditation badge was dangling around my neck in just 30 minutes. Not bad at all. Now, the main task of the day: Welcoming the Super Eagles to São Paulo. The information at our disposal was that the Nigerian team would arrive the Gaurulhos International Airport on American Airlines from Miami at 8.40pm local time in São Paulo. We arrived the airport with 45 minutes to spare only for us to discover that the flight had suffered a delay and was now expected at 9.44pm local time. Worse was to come. A check at the FIFA official reception desk confirmed the new arrival time, but the lady at the counter had bad news for us. Yes, the Nigerian official delegation was expected at 9.44pm. Yes, they would fly in on American Airlines. But no, we would not be able to receive them because they would land at Terminal 4 and there would be no access to the press or public to receive them. What?! Why? How can that be?, we bombarded the lady with questions. That is the decision of the organizing committee of FIFA, she said courteously but with an air of finality. We were left guessing as to why FIFA would deny media access to receive the official World Cup delegations. A plausible explanation was security and safety of the delegations. But we decided not to give up yet so, off we went to Terminal 4. After some consultations by another set of World Cup Local Organizing Committee officials which raised our hopes temporarily, the depressing news was confirmed that we would not be able to receive the Super Eagles. I couldn't get the interviews that I had planned, but I was more disappointed for the NTA television crew who had hoped to record the team's arrival and file the pictures home for Nigerians to see on the national network. It was a dejected team of Nigerian journalists that filed back into our bus and headed back to Hotel Santana at 11pm. The main task of a long and stressful day was Mission Unaccomplished!